A little bit of planning can mean the difference between a run-of-the-mill vacation and an amazing one! Wander wisely in Pfaeffikon by familiarizing yourself with a few details about it before you get there. If you travel 0.5 miles (0.8 kilometers) east of Freienbach, or 3 miles (5 kilometers) west of Lachen, you'll arrive in Pfaeffikon. A big part of traveling is meeting people, so why not make friends with some of the 11,000 locals who live in this corner of Switzerland? Get unbelievable savings on Travelocity's Pfaeffikon airfare and accommodation package deals. You'll also have plenty to pick from with no less than 400 airline partners and 665,000 properties. Our Customer 1st Guarantee gives you 24/7 personal assistance on everything from flights and accommodations to rental cars and experiences. If you happen to notice a cheaper price on another site, we'll refund the difference^. With no hidden fees or charges from us, there's no need to stress about having to change your itinerary. And as long as you get in fast, many accommodations won't charge you either^. Headed to Pfaeffikon? Don't leave it until the last minute to secure one of its 6 available lodgings. After you've made your choice, all that’s left is the fun part — actually being there! When you have a vacation to organize, who wants to waste time searching for a place to stay? Don't worry, we've done all the hard work for you. The Panorama Resort & Spa and Seedamm Plaza are a few of our favorite properties in the area. Where do you fly into for Pfaeffikon? Put your seat in the upright position and get ready to explore Pfaeffikon! Once you touch down at Zurich Airport (ZRH), the buzzing main streets will be only 20 miles (32 kilometers) to the southeast from here. Can I rent a car in Pfaeffikon? While the usual tourist areas in Pfaeffikon are nice to see, why not take it a step further and discover some cool new sights with a rental car via Travelocity? Collecting a car straight from Zurich Airport will mean you don't have the stress of cabs and transfers. Sixt and Budget are worth looking at. Located 1 mile (2 kilometers) from the center of town at Talbachstrasse 9 is Europcar. Head on over and they'll get you behind the wheel in no time! Whether you're aiming for a hole-in-one or simply in the mood to have some outdoor fun, you're sure to have a ball (pun intended) at Bubikon Golf Club. Need some more options? Traipse through the age-old rooms, halls and corridors of Rapperswil Castle. This stately structure provides an educational excursion for everyone. And there's more. Wouldn't mind adding some greater meaning to your vacation? Make the journey to Einsiedeln Abbey. No matter what your beliefs, it's the ideal place to familiarize yourself with the local religion. If you've explored the very best of Pfaeffikon already, don't pack up and go just yet. In fact, you've got iconic attractions just a stone's throw from here! Just 60 miles (97 kilometers) away is Loerrach. 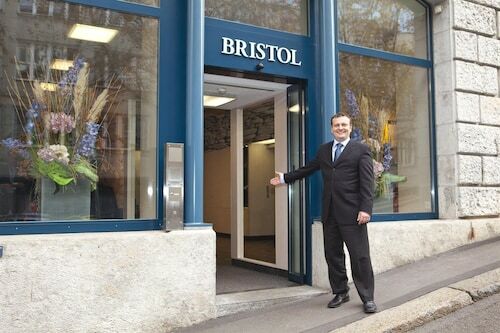 Many visitors use this locality as a base to visit the world-renowned attraction, the Messeturm Basel. 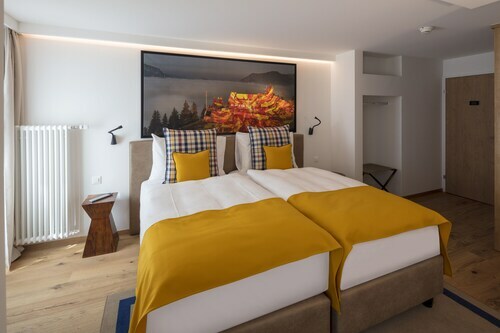 This family-friendly Freienbach hotel is located on a lake, within 3 mi (5 km) of Alpamare Water Park, Rapperswil Castle and Rapperswil-Jona Municipal Museum. Knies Kinderzoo and Einsiedeln Abbey are also within 12 mi (20 km). Freienbach Pfaeffikon Station is 14 minutes by foot. 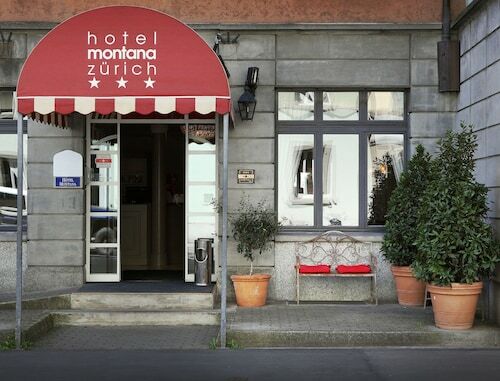 Located in Old Town, this hotel is within a 10-minute walk of Ethnographic Museum at the University of Zurich and Bahnhofstrasse. Zurich Town Hall and Swiss National Museum are also within 1 mi (2 km). Selnau Station and Stockerstrasse Tram Stop are within a 5-minute walk. Located in Oberstrass, this hotel is within a 10-minute walk of Liebfrauen Church, Swiss National Museum, and ETH Zurich. Zurich Town Hall and Kunsthaus Zurich are also within 15 minutes. Haldenegg Tram Stop is only a 2-minute walk and Stampfenbachplatz Tram Stop is 4 minutes. 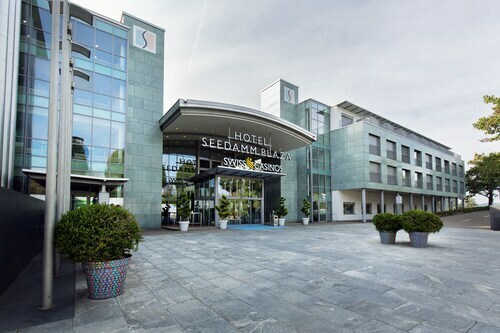 Situated on the banks of the river Limmat, in the heart of Zürich, this hotel is a 5-minute walk from Swiss National Museum and the main train station. Fraumünster and Museum of Design are both 1.5 km (1 mi.) away.